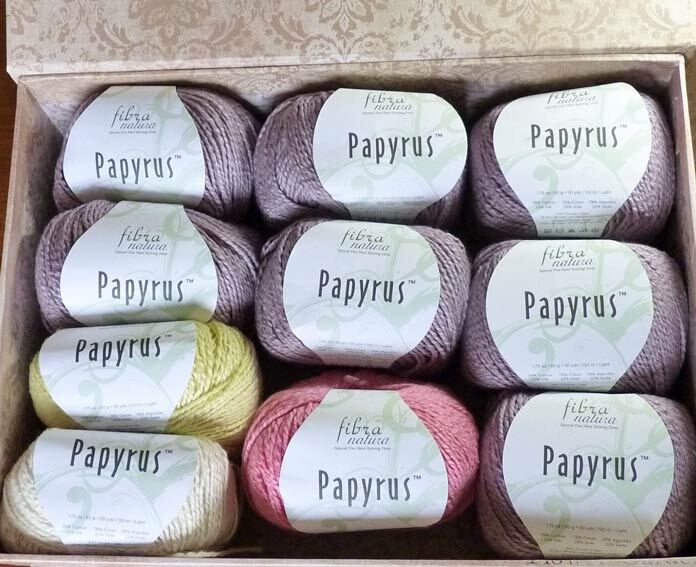 This week, I’ve been blogging about Papyrus, a soft, summery cotton and silk yarn by Fibra Natura. On Monday, I talked about the unique construction qualities of Papyrus. On Tuesday, I gave ways our swatches can have useful lives beyond recording what our gauge is. On Wednesday, I looked at the color range of Papyrus and shared several free PDF patterns. 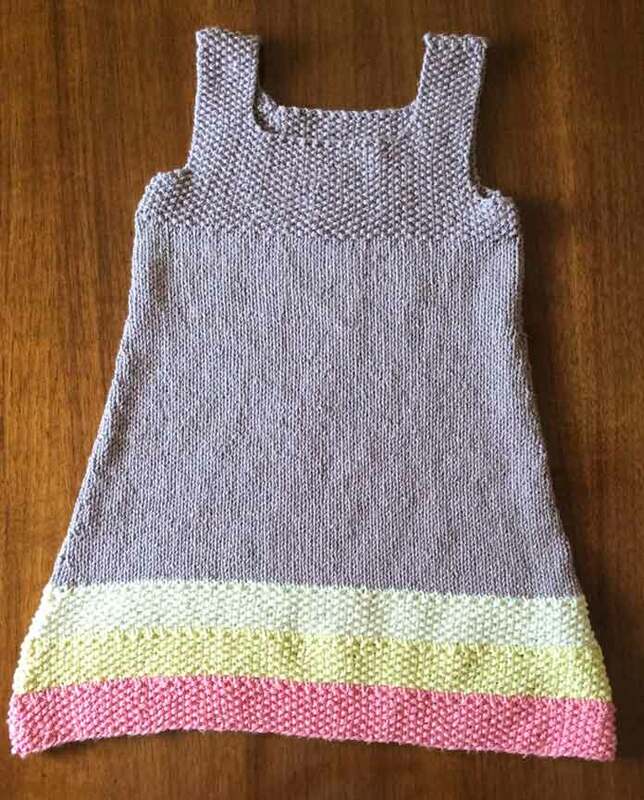 We’re wrapping up this week with a pattern I’ve designed for a toddler’s tunic. Yesterday, I gave the pattern from the hem to the lower edge of the bodice and gave details about cast ons, decreases and also gave useful tips for reading patterns in general. The aim of these two posts is to help absolute beginner knitters succeed at reading patterns and develop good techniques. I know. I used this photo earlier in the week, but it’s just so pretty! It makes me want to knit something as beautiful as the box! 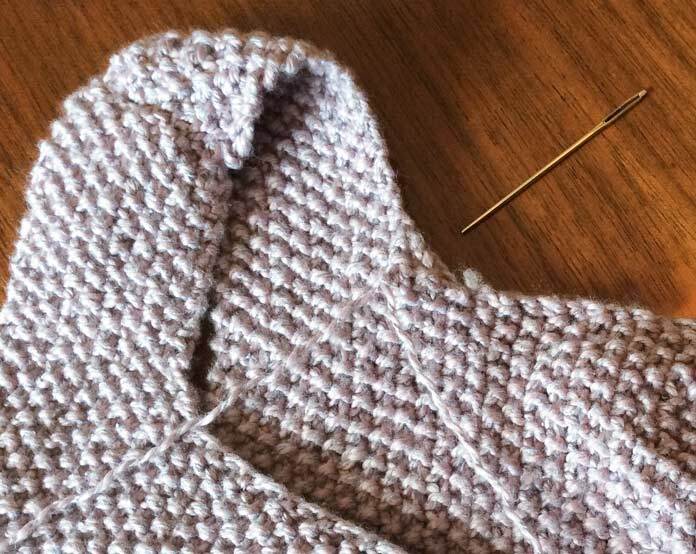 I got really wordy with my “run down” in yesterday’s post, but it was all in an effort to make beginner knitters successful at reading patterns – not just my patterns, but any patterns! So, let’s get started on the rest of our toddler tunic, picking up where I left off. Use the link above, or the “Go back” link at the bottom of this post for the pattern up to this point and for the abbreviations. Change to straight needles, size 5 [3.75mm]. Work will proceed back-and-forth. Remove round markers as they appear. Row 1: (k1, p1) to last st before marker, k1. 53 (57, 63) sts on needle. Leave rem sts on circular needle. Turn work. Repeat Row 1 for a total of 8 rows (1” [2.5cm]). Row 1: Cast off 2 sts, (p1, k1) to end. 51 (55, 61) sts. Rows 2-4: Repeat Row 1. 45 (49, 55) sts. Row 5: P2tog (k1, p1) to last 3 sts, p2tog. 43 (47, 53) sts. Row 6: (P1, k1) to last st, p1. Row 7: Ssk, (p1, k1) to last 3 sts, p1, k2tog. 41 (45, 51) sts. Row 8: (k1, p1) to last st, k1. Largest size only: Repeat Rows 5 – 8. (47 sts) ***Continue in pattern until work from start of bodice measures 2½” [6.3cm], ending with RS facing for next row. Row 2: (k1, p1) 6 times. Row 4: (k1, p1) to last st, k1. Row 6: (K1, p1) to end. Row 7: (P1, k1) to end. Repeat rows 6 and 7 until knitting measures 5½ (6, 6½)” [14 (15, 16.5) cm] from the beginning of the bodice. Cast off all sts. Break yarn. With WS facing and Col A, join yarn at neck edge. Row 3: (K1, p1) 5 times, k1. Row 5: (P1, k1) to end. Repeat Rows 5 and 6 until knitting measures 5½ (6, 6½)” [14 (15, 16.5) cm] from the beginning of the bodice. Cast off all sts. Break yarn. With RS facing, join Col A. Row 1: (k1, p1) to last st, k1. 53 (57, 63) sts on needle. Turn work. Repeat Row 1 for a total of 8 rows (1” [2.5cm]). Work as given for Shape Armhole to ***. Continue in pattern until work from start of bodice measures 3½” [9cm], ending with RS facing for next row. Shape neck and shoulder straps as given for Bodice front, above. Sew the shoulder seams together. Sew bodice seams under arms using mattress stitch. Weave in all ends. The bodice of a garment is an area where structure is desired. I tell my students that the shoulder seams of a garment act as the “coat hanger”: you want structure so that the rest of the garment will hang properly. 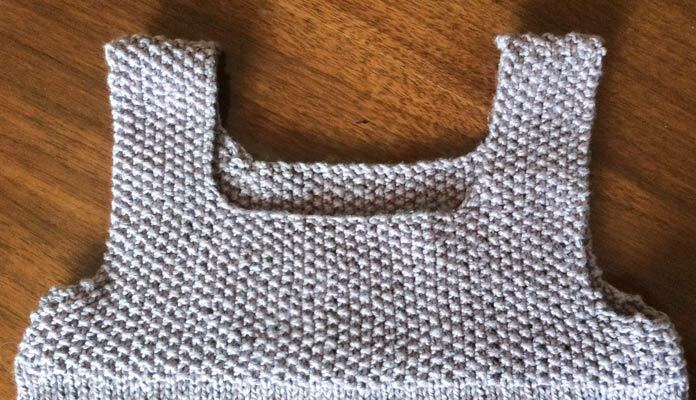 By going to a slightly smaller needle size, and switching to seed stitch, we can add structure and not lose anything in the way of chest size, because seed stitch tends to expand slightly horizontally. Once we’ve knitted up the stitches for the front of the bodice, the circular needle serves as the stitch holder. This saves transferring the remaining stitches onto a stitch holder and putting them back onto a needle when we go to do the back of the bodice. I’d have written this section “work in seed stitch for 8 rows,” but if I had, the pattern would be elevated to an intermediate level, in my opinion. 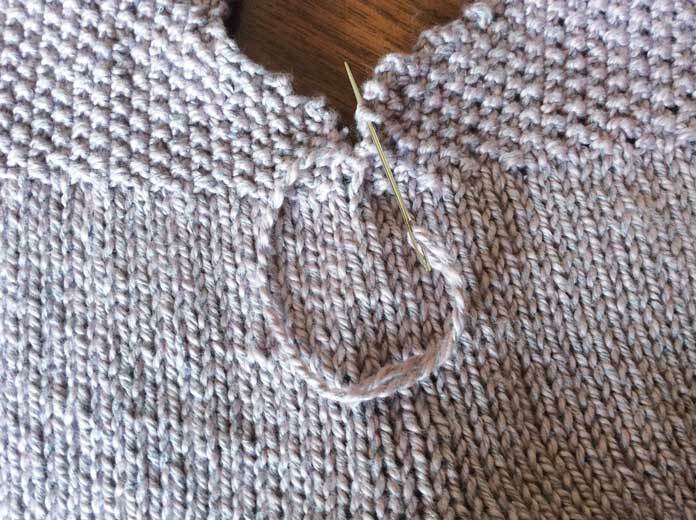 Under “Shaping the armhole,” I wrote the instruction so that the next stitch after the cast off stitch will be the one that presents to the knitter, NOT the one that was worked to facilitate the second cast off stitch. Most patterns assume that the knitter knows that the stitch on the right needle is part of the next stitch to be worked, but when I began knitting it caused much consternation. If I was writing this pattern for an intermediate or advanced level, I’d hold to the practice of “most patterns,” however, I’m writing it for an absolute beginner, so I’ve written it the way my “beginner knitter mind” worked. Intermediate and advanced knitters you’ll recognize that we’re working seed stitch here, so the next stitch will need to be worked as a purl, but I want an absolute beginner to be able to follow my direction to the letter. In this section, three asterisks (***) have been inserted. They’ll come into play when we’re working the bodice back. Note that I’ve given a lot of stitch counts in this section. Again, the purpose for this is to provide ample opportunities for a beginner knitter to be able to double-check their work. Intermediate knitters are apt to find them handy, too, while advanced knitters may want to skip over most of them. After row 5 on the first strap, and row 4 of the second strap, I could have instructed “continue working in pattern until work measures….” Again, I’ve written it the “spelled out” way for the benefit of beginning knitters. Once a beginner has worked several patterns of this nature, they’ll be able to go with the more vague instruction given quotes, above. The bodice back has many similarities to the bodice front. Rather than repeat all that text for the back of the garment, most patterns will refer the knitter back up to the pertinent sections. The sentence after the three asterisks (***) in the bodice front directions differs on the back, so I wrote the pattern in a way I can explain it without having to repeat a lot of text. Shoulder seams: As I noted earlier in this post, the shoulder seams are the “coat hanger” of your garment. I like to see a sturdy cast off and a solid seam. For this little tunic, I chose whip stitch. Wherever possible, I like to use an existing yarn end to sew into a seam – it gives the yarn end a place to go, and it reduces bulk at the point where a new strand of yarn would be added. In this project, I took the tail from the strap’s cast off. I threaded it into a tapestry needle, and placed the straps right sides together. The cast off edge of both straps form a nice, double chain. I pierce the opposite strap, right in the beginning stitch of its cast off edge, then I go back through the first strap and sew back into the original strap. Then, I go over the edge, and put the tapestry needle under the “V” strands of both straps’ chain edge, repeating this all along the edge. When I’m a few stitches away from the end of the seam, I weave that strand of yarn back toward the beginning. There’s another strand of yarn, and it needs to be woven in, too. I’ll thread that strand, and finish my seam by working toward the completed seam, then work this strand into the seam as well. 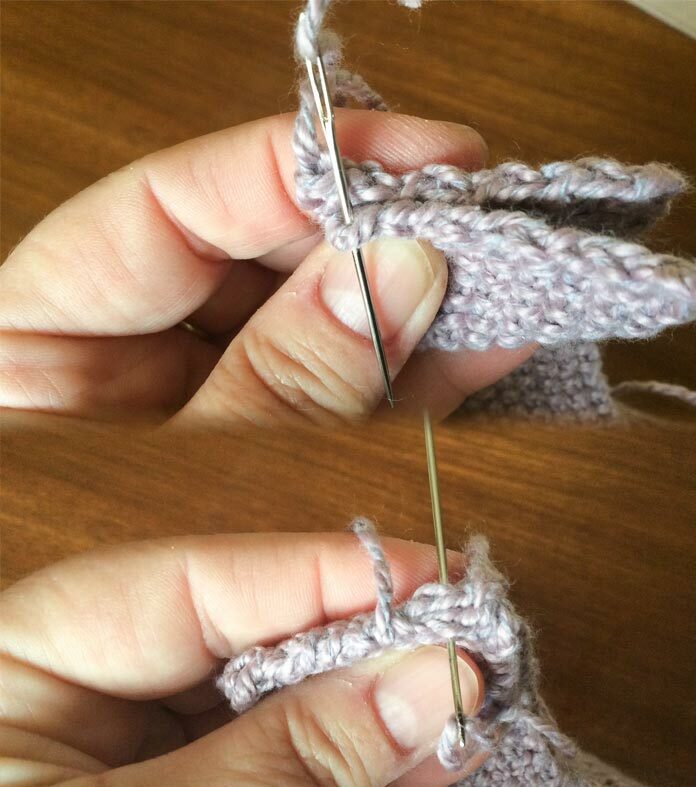 In the top photo, the yarn end originated in the back piece, and the tapestry needle is pointing toward the knitter, through the edge stitch of the cast off on the front piece. In the bottom photo, the seam has been whip stitched part way across the seam, and the yarn tail is being held at the back. The tapestry needle now holds the yarn end from the front strap, and it’s been inserted under the cast off edge of both pieces from front to back. While we’re talking about weaving in ends, as long as the yarn end can be woven into a seam, I recommend that you do that. However, we have one yarn end at the neckline on both the front and back of the bodice that have no seam in which to hide. My preferred method of weaving these ends is to thread the whole strand in a tapestry needle, find a nearby place to get that strand to the back of the work, then weave it through for a stitch or two. At that point, I split the yarn into individual plies or pairs of plies if possible. Then, I weave each of those ends into the back of the fabric in different directions. This not only makes it harder to detect the woven in ends from the front of the work, but in the case of a garment that will be treated with less-than-ideal care, it also anchors those ends in more securely and makes it difficult for cut ends to come loose. The tip of the needle shows where our yarn end began. I’ve woven the whole strand in several stitches, by following the path of the stitches in the fabric. The yarn has been split, and these two ends will be woven off in different directions to make a strong weave that will be difficult to detect from the right side. Finally, the finishing instructions talk about using mattress stitch to sew up those short, 1″ seams of the bodice below the under arms. I’ve already explained why I designed this pattern to have these two short seams, so let’s talk about mattress stitch. It’s the one technique that elevated my knits from looking home made to looking hand made. I begin the mattress stitch by threading a yarn end into a tapestry needle. I lay the pieces out side-by-side with the right sides up, then, I put the needle into the bump of the other piece opposite my yarn end. I work up (in this case) or down the seam, picking up one bump from the edge of each piece alternately all the way. On a long seam, I will do a back stitch through the last two bumps every couple inches. Mattress stitch is worked by laying the project pieces side-by-side and picking up the “bumps” from each piece in an alternating fashion. I hope my explanations about what goes through the mind of a designer, and my tips for elevating the quality of your knits have been helpful. I know they’ve been wordy! I’ve really enjoyed my week with Papyrus yarn and recommend that you give it a try! The effort of executing all our little details has paid off: The finished tunic has a professional look, and it will look great on the playground!